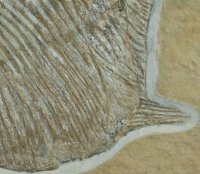 Stunning Solnhofen Jurassic Gyrodus Fossil Fish [FISH429] : Fossils Online, Welcome! 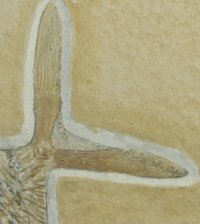 Here is an extremely fine specimen of a Jurassic aged fossil fish from famous Solnhofen lithographic limestone of southern Germany. Firstly, I want to say that as of this posting there isn't another fossil like this for sale anywhere on the net. 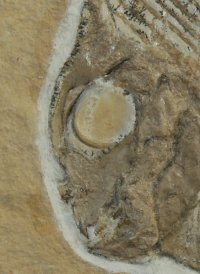 The only other one (Google Gyrodus fossil fish)is a ridiculously overpriced specimen that was broken in several pieces. I won't insult your intelligence by hyping up and overcharging for a mediocre specimen. This beautifully preserved fish is perfectly centered on this slab that has only been cut on the sides. The top and bottom are natural breaks as evidenced by the dendrites that leeched in the layer through those cracks. Those dendrites are a visually appealing and interesting natural effect on this showcase fossil. Every last detail has been perfectly preserved. The eye ring, teeth and the tiniest fins on his tail are all there in excellent detail and untouched. There are only a handful of ribs that have been restored, both near the upper and lower fins on the body...about the size of a quarter combined. The fish measures 6 7/8" from the tip of the nose to the tip of the upper lobe of his tail. The slab measures approximately 16" x 8.5". A truly investment quality fossil. Enjoy!